The Lake District is an area of incredible natural beauty. Located in Cumbria in the north west of England, the Lake District is home to rolling hills, soaring mountains, dense woodland and of course, sprawling lakes. Renting a pet-friendly self-catering cottage in Lakeland is a brilliant way to experience this stunning part of the United Kingdom with friends, loved ones and family, but often visitors have to leave a certain part of the family at home – the dog. 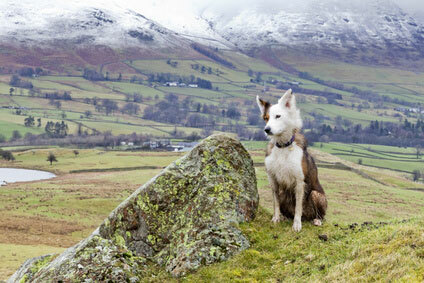 Thankfully, there are plenty of cottages where canines of all kind are welcome in the Lake District! Dogs are as much a part of the family as anyone else for many people, and the thought of leaving them at home or in the kennels while the rest of the clan enjoy a great holiday is out of the question. Thankfully, there are plenty of options for those looking to stay in a cottage in the Lake District and bring their pet with them to stay. Dog and pet-friendly cottages are just like any other cottage, except they welcome dogs with arms wide open! The Lake District is a stunning area with lots of incredible scenery and paths to take your pet for a walk each day and your dog will absolutely adore visiting a different part of the United Kingdom with their family! As well as stunning scenery, the Lake District is home to quaint villages and charming towns, and there are plenty of attractions in these settlements that also welcome dogs. The stunning grounds of Holker Hall just outside the medieval village of Cartmel is one of these places, and the magnificent gardens and courtyard café warmly greet dogs every day. There is also Grizedale Forest which has several nature trails for the whole family, and is home to lots of sculptures which are fun to spot. The Cumberland Pencil Museum in Keswick also welcomes dogs and as well as a Kids Art Studio for those creative little tots, there are lots of interesting things on display such as the world’s longest colour pencil. Even if you just plan to go on many hikes, walks or even relaxing cycles by Lake Windermere, the Lake District is a haven for dogs and it would be a shame to leave the pooch at home. Thankfully, you can take them with you when you rent certain cottages in the Lake District, and the whole family can enjoy and experience this striking part of England together, in a holiday that none of you will ever forget.